Nowadays, tablets, phones and several other gadgets are charged via USB. Due to advancements in technology, most of us tend to own up to 2 different devices. If we were to take that as an average figure, let us assume that we are dealing with a household that has 5 people. This would mean that, the specific household would have a total of 10 devices. How many wall plugs and USB adapters do you think would suffice such a household? We all want our gadgets fully charged and ever operational! This is where the best USB charging stations come in. 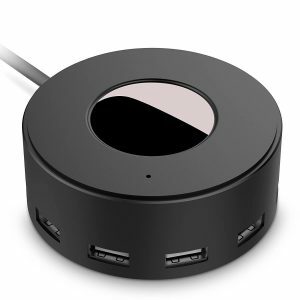 USB charging stations are able to simultaneously charge multiple devices. They make everything less hectic because some of them have up to ten USB ports. Their level of convenience shouldn’t be underestimated. If you wish to use them on your desk or table, you will soon realize how neat your work station will be. You won’t have to deal with piles of wall adapters and volumes of unwanted cables. The best USB charging station will remove any unnecessary frustrations you went through before. No more losing cables or having your adapters accidentally switched with someone else’s. What factors must you consider while choosing USB Charging Stations? The USB charging station’s power output: Our devices have different power requirements. That is why we can’t just settle for any charging station. If you choose one which will deliver too much power, it may end up overcharged. Be keen and buy one which will provide the needed power. Nothing more, nothing less! 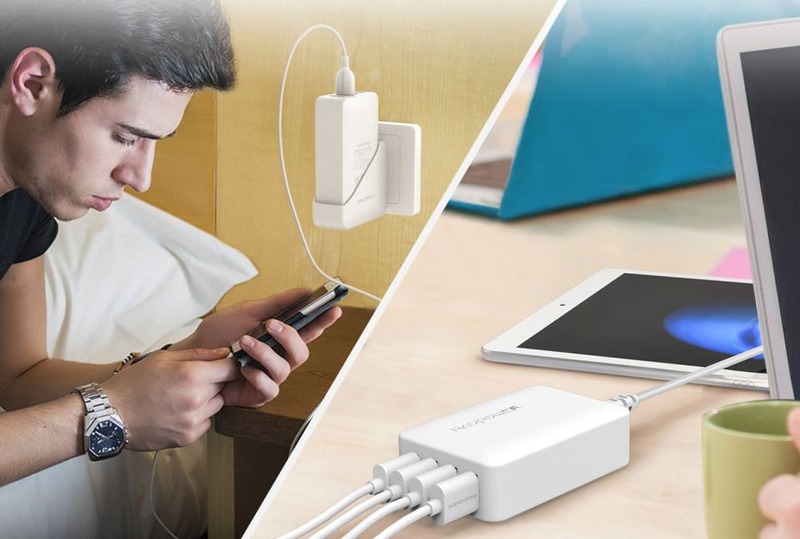 Compatibility: For your USB charging station to be of most convenience, you need to be able to use it anywhere. This is important, especially for people who tend to travel a lot. The charging station needs to be adjustable between 110V and 240 V I-smart technology: this is one of the best choices that you could make. Buying a charging station that can deliver your device’s optimum charge, for fast charging is highly recommended. You won’t expose them to higher amps than needed. Charging indicators: Sometimes our devices get fully charged without us being aware of it. This may lead to them getting overheated or overcharged. To avoid this, buy a USB charging station with an LED indicator. The indicator will make you aware of your phone’s charge status. You will be able to unplug it, immediately you notice the LED. 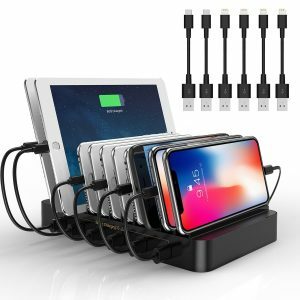 This USB charging station is compatible with iPhone X/8,7/7s 6/6S Plus, 5/5S, iPad Pro, Galaxy S8/7, S6 Edge Plus, S6, Nexus, HTC and other SmartPhones. It is the ideal option for someone seeking 100% compatibility. You won’t regret this purchase, since it will outperform all your other charging means. The charging station has been certified by the CE, FCC and RoHS. It is far superior than most of the available options in the market. 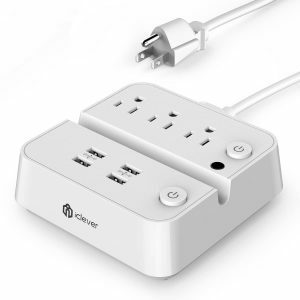 Your purchase will include; a multi-Port USB Charger, a phone stand, and a power Cord. On top of that, you will get a 24 month breakage warranty. In case of any issues, the company also provides a 90-Day Money Back Guarantee. The station has 4 ports and a 24 watts Rapid Smart charging adapter. 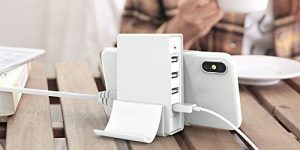 NEXGADGET offers a USB charging station that can handle up to 10 devices simultaneously. It is very powerful and even has smart IC installed. Each of the USB ports has the capability to identify your device intelligently. By doing so, the charging speed of your device is maximized as well. You could call it a space organizer, but it is as professional as it gets. All your gadgets will be neatly kept in one place. It is portable and provides protection from over-voltage, over-current and short circuit. It definitely has premium circuitry. The in-built PVC copper wire used is of high quality as well. You will also get an Intelligent Detection System, with this Asltoy USB charging station. This ensures automatic identification, and guarantees that your device will get a safe current at fast possible. I would recommend this station for devices which are 5V USB-charged. The security system it offers is so comprehensive. As a result it has certifications from; CE, FCC, ROHS, CUL, UL, SAA and ERP. You will be getting a combination of a Stand, Dock and Station, that is suitable for international use. This purchase will get you 3 AC outlets and 4 USB ports. 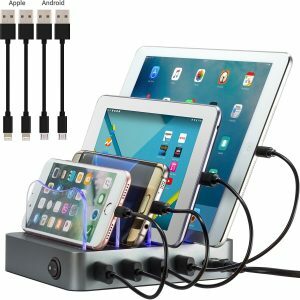 What makes this USB charging station stand out, is the fact that it has individual control switches. Thanks to this, you will easily be able to manually control the USB and AC ports’ output. It has been designed in a manner that, when the current exceeds threshold, the circuit automatically breaks off. This is what prevents any fire, sparks and other damages. 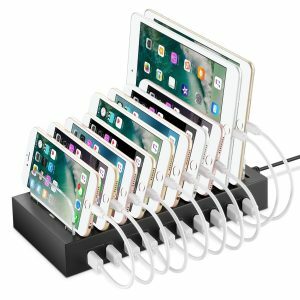 What makes this charging station unique is the fact that it has 4 Built-in retractable charge cables which are 1A. This is great because, especially when you don’t have a charging cable nearby. The station has two sides to it. Side A has 6 Smart USB charging ports, while side B can handle charging up to 10 devices. The 6 USB ports are 2.4A each. I would recommend this for people who like unique items. 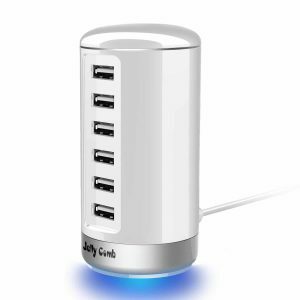 This USB charging station comes in form of, a Jelly Comb Multi Port Rapid Smart Charge Tower. It is very stylish, and simplifies your décor. Be it at home or at your office, you will fall in love with the neat charging location. Let its shape not worry you, it is very stable, especially thanks to its rubberized bottom. So in total, the charging tower offers 30 Watts and 6 Amps. Vogek has one of the best solutions for freeing up your home and office outlets. The USB charging station has a low center of gravity design. Because of this, it will not tip over when you are charging multiple devices. The charging station has an LED indicator, which will alert you whether it’s properly connected to the power source. It even has an anti-slip silicone rubber circle, which will keep it securely positioned. Although one might mistake it for the usual knockoffs, the truth is only unveiled when you try using this charging station. It’s a great masterpiece equipped with the latest technology. Simicore has been greatly recommended by users with; cameras, eReaders, Bluetooth headsets, iPhones, iPads, Android SmartPhones, tablets, speakers and more. Out of the four USB charging ports, two are high-powered. The two are fast charging and great for devices which are power hungry. 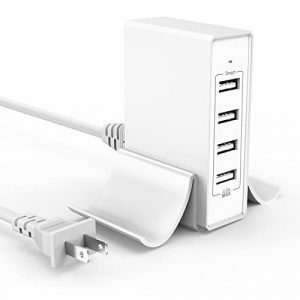 Collectively, all the 4 ports have about 6.8A. It will be able to hold your devices with a good grip, so you won’t have to worry about them slipping out. If you’re looking for a product worth a purchase, then consider adding this to your cart. You would better enjoy this USB charging station, if you have OEM or RAVPower cables. This station has been classified as 100% safe to use. You will get protection from short circuits, overcharging and overheating. This USB charging station is so powerful that it has the capability to simultaneously charge 4 tablets at full speed. Each port has a maximum output of 2.4A; hence the total output is 8A/40W. It can easily turn in to a travel adapter, thanks to its foldable pins. Just like its sibling on the 2nd position, this is a great USB charging station. 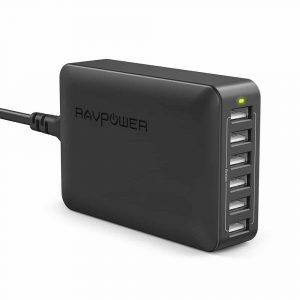 RAVPower boasts of being one of the most trusted, USB charging stations around the world. The power supply is gigantic and reliable at 60W/12A collectively. The station has 100V-240V, which makes it safe to use globally. 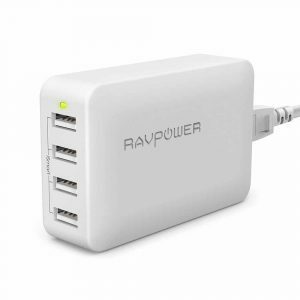 Your purchase gets you a; RAVPower 60W 6-Port USB Charging Station, a 5ft detachable power cord and a user guide. Additionally, you will also get an 18 month warranty. On registration, the warranty gets 12 extra months. Being the best on the market, one can be sure to get the best results. Of course, it’s equipped with the latest features and an advanced technology which guarantees ultimate performance. If you have never owned a USB charging station, this review is exactly what you need. Most users will tell you how charging stations, have turned things around for the better. You don’t have to miss on anything again, just because you couldn’t get charging access. 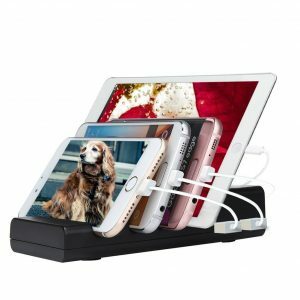 This top 10 best USB charging stations review will ensure that you get the perfect station for new found convenience.